PARSIPPANY, NJ--(Marketwired - July 21, 2014) - In celebration of National Vacation Rental Month, Wyndham Vacation Rentals, the world's largest professionally managed vacation rental business and part of the Wyndham Worldwide family of brands (NYSE: WYN), is sharing seven reasons why vacation rentals offer travelers a better way to get away. Celebrated each July, the most popular month for vacation rental stays, National Vacation Rental Month recognizes the many benefits of this accommodation option, from more space and greater value to increased privacy and in-home amenities. "What better time than National Vacation Rental Month to highlight the vacation rental experience," said Bob Milne, president, Wyndham Vacation Rentals North America. "Recent studies show that vacation rentals give guests more for their money by letting them eat in, pack less, and spread out, all while enjoying a relaxing vacation with family and friends. It's this total package that allows for a truly memorable time. With our National Vacation Rental Month deals, travelers still have time to experience the benefits first-hand this summer and save on stays in some of the country's top destinations." Vacation rentals give travelers more for their money. The average price per bedroom per day of a vacation rental is only $69 USD, vs. the $112.45 USD average for a hotel room. In addition, vacation rentals offer an average of 2.7 bedrooms, making them a great option for families and larger groups looking to stay together under one roof and share vacation costs. Vacation rentals provide more vacation space. The average square footage of a vacation rental is 1,850, whereas hotels only average 325, giving guests extra space to spread out. 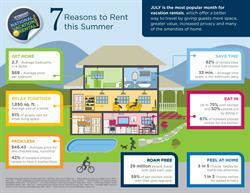 Eighty-one percent of guests stay in a vacation rental for more living space. Vacation rentals offer fully-equipped kitchens. Eating out on vacation can add up quickly, both in calories and costs. Most vacation rentals include fully-equipped kitchens, allowing guests to prepare some meals themselves. Dining in can save guests up to 75 percent and help cut calories by 50 percent. Vacation rentals save time with multiple bathrooms. Eighty-two percent of the vacation rentals that Wyndham Vacation Rentals manages have two or more bathrooms. Since Americans on average spend 33 minutes in the bathroom each day, this benefit can save families valuable time and stress while on vacation. Vacation rentals help cut down on baggage. The average price for one checked bag on a roundtrip flight is $46.42 USD, making the decision of what to pack for vacation an important one. Many vacation rentals offer in-unit washers/dryers, helping guests pack less and save on baggage fees or room in the car. Forty-two percent of travelers choose vacation rentals for this convenient amenity. Vacation rentals offer pet-friendly travel options. Each year, approximately 29 million people travel with their pets, making pet-friendly accommodations an important travel option. With many of the advantages of home like more space and privacy, vacation rentals can help maintain some of the familiarity and routine that some pets crave. Many even offer private outdoor space like decks and fenced-in back-yards. Vacation rentals give travelers the comforts of home. From the in-home amenities, like kitchens and washers/dryers, to the extra space and privacy, vacation rentals can help travelers feel at home on vacation. In fact, three in five travelers choose vacation rentals for the home-like amenities. To learn more about the benefits of vacation rentals and to book one of our National Vacation Rental Month deals offering up to 35 percent*† off stays across our U.S. vacation destinations, visit WyndhamVacationRentals.com. *Vacation must be booked by July 31, 2014 with travel to occur by September 1, 2014. To learn more, visit NationalVacationRentalMonth.com. † These vacations are limited and subject to availability. Wyndham Vacation Rentals, the world's largest professionally managed vacation rentals business, is part of Wyndham Exchange & Rentals and the Wyndham Worldwide family of brands (NYSE: WYN). Backed by one of the world's largest hospitality companies, Wyndham Vacation Rentals provides access to more than 100,000 vacation rental properties in approximately 600 unique destinations worldwide. Specializing in the managed vacation rental segment, Wyndham works closely with property owners to ensure all rentals meet its standards for customer service, quality and comfort. With a diverse and celebrated collection of more than 25 rental brands including Canvas Holidays by Wyndham Vacation Rentals, Hoseasons by Wyndham Vacation Rentals, James Villa Holidays by Wyndham Vacation Rentals, Landal GreenParks®, Novasol® by Wyndham Vacation Rentals, ResortQuest® by Wyndham Vacation Rentals® and The Resort Company® by Wyndham Vacation Rentals, Wyndham Vacation Rentals delivers distinct vacation experiences, ranging from beachfront condos, private homes, villas, castles and houseboats, with many properties offering kitchens, washers and dryers, maid service, spa and fitness centers, and golf courses. For additional information visit our media center or wyndhamvacationrentals.com. Wyndham Vacation Rentals also can be found on Facebook. 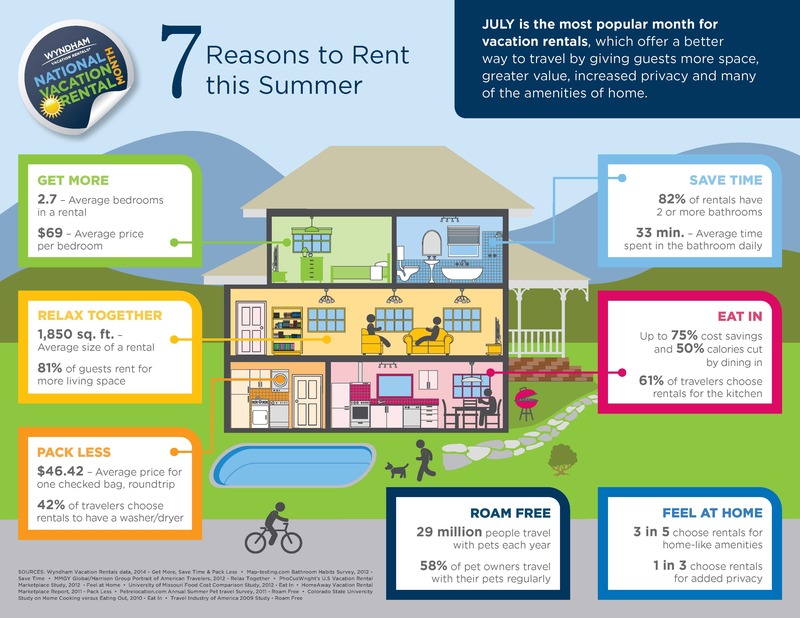 In celebration of National Vacation Rental Month, Wyndham Vacation Rentals shares seven reasons why rentals offer a better way to get away.